Group photo! Thank you to those who gave me suggestions during the process of this piece. Very nice and cute illustration! These kind of fanarts turn me in good mood! WAIT is Sable (i think she's the brown hedgehog) holding a baby hdgehog? It's a folded shirt, like seen in game. This is really cute and vry well done! Do you take commissions, like this one? A little yes and no. Using my commission information (here -> Commission sheet ) as a ref, I can give you a couple options. If you're looking for a commission in a similar style to this painting, but with only a subject or two, it would be under the "refined drawing" classification. Not to expensive, but not terribly cheap either. However, if you're looking at something large scale, like a full background and various characters like this painting, it would be under the "painting" classification. Something this large takes quite a bit of time and is, unfortunately, not cheap. 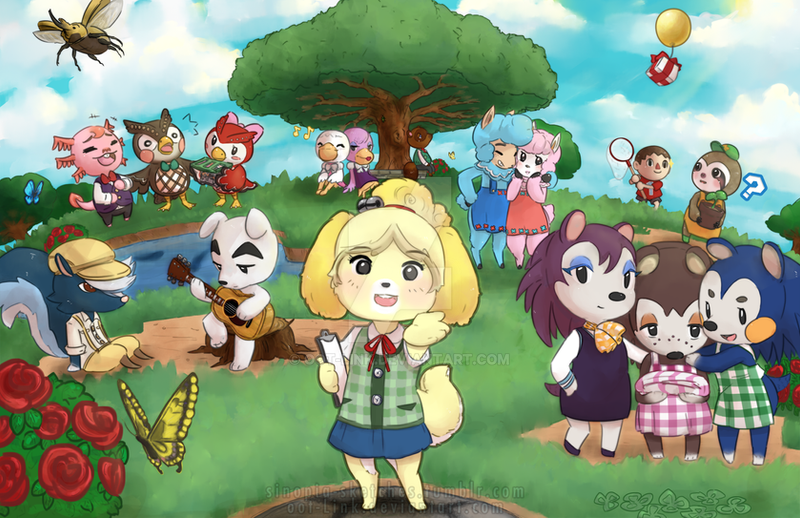 This Animal Crossing piece took me well over 40 hours to complete. I will only take serious commissioners willing to work along side me for pieces this intricate. I apologize for the daunting amount of information. I'm happy to take on commissions, and I thank you very much for your interest. New Leaf is awesome! How badass would it be if you just moved into a new town and everyone suddenly thinks your the new mayor? This picture is so amazing I set it as my wallpaper! Animal Crossing:New Leaf rocks! and this picture also rocks too. Thanks.Do you like that show? Yeah.I have some friends that like it. Omg I have this game,and I love it! Hi, um, I really love your artwork, and I was wondering would you allow me to use this image for a video? It'll still have the watermark on, and I'll link to you in the description, my channel is basically the same as my username if you need to look at my channel, thank you! Hey there. Thank you for asking. If the watermark would still be there, then I don't see why not. c: Since the watermark includes this account's name, there shouldn't be a need to reference me as the artist either. Thank you again for asking. I hope your video turns out well! Thank you so much! And yes, the watermark is there, but, hey, I'll put you in the description anyway if people ever want the picture ^_^ But, again, thank you for letting me use it! Kicks the skunk. He sells shoes/socks. Is there a wallpaper of this that you have? I would love to use it if so.